Looking for a website for your environmental-friendly company or NGO? Here are 25 best nature WordPress themes for building awesome, fully functional websites for any types of businesses or foundations with activities in the nature niche. Choose your favorite WordPress theme form this list. Setting it up is easy and customization is a breeze with the help of the integrated page builders. Enjoy! 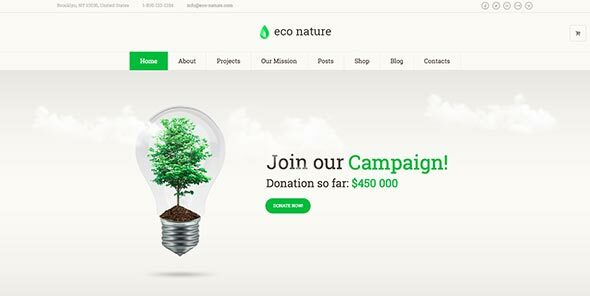 Eco Nature is nature WordPress theme that is the perfect solution for building websites for environmental-friendly companies, nonprofit causes, events, gathering donations, and more. 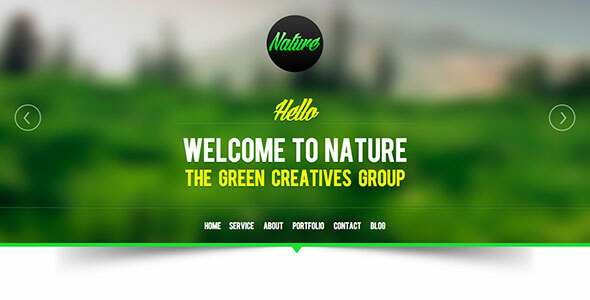 Nature is a responsive one-page WordPress theme based on the Bootstrap Front End Framework. This theme is targeted to small business with a focus on nature, environment and more. It is clean coded and uses the latest HTML5 and CSS3 technologies. 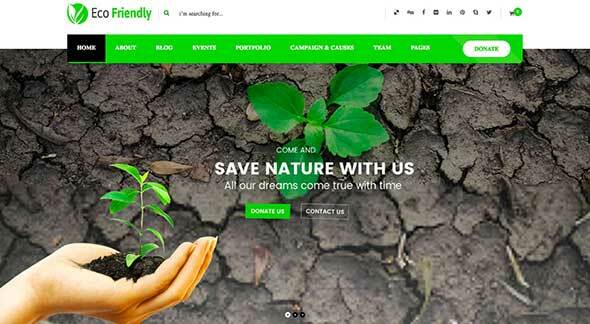 Eco Nature is another nature-friendly WordPress theme targeted to businesses that have the purpose of saving the nature. 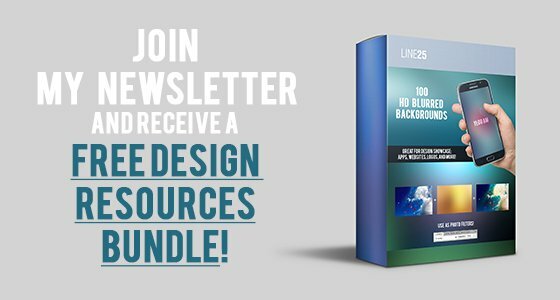 It comes with unlimited design solutions, so you can easily customize it as you please, and a bunch of shortcodes for increase functionality. 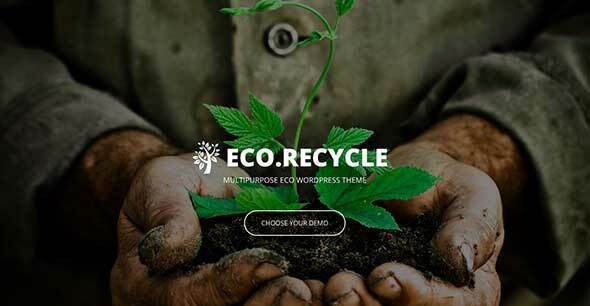 Eco Recycling is a multipurpose nature WordPress theme you can use for building environment-friendly websites. Use it for businesses in the ecology and recycling awareness fields. It comes with all the needed tools to make your website stand out. Green Nature is a responsive WordPress theme designed for nature, environment, wildlife non-profit foundations. You can use it to gather donations, make your events known to the public, and more! It uses the GoodLayers page builder which is powered by drag and drop modules. Go Solar is a WordPress theme developed to help companies that are eco-friendly and want to save the nature. use it for any kind of business in this niche, as well as for non-profit organizations that need a strong online presence. Eco Press is a great solution for building nature-related websites. It is also a great fit for non-profit organizations, animal-saving fundraisers, green world movements and more, as it comes with a fully functional donation system for raising funds for your cause. Eco World WordPress theme is designed to target environment protection companies, nature-related websites and non-profit organizations in this field. It has a donations functionality with easy to integrate payment options. Greenlife is a modern WordPress theme for environmental, eco-friendly websites. It can be also used for other related purposes, such as charity events and even corporate sites. It is built on the Bootstrap and Powerful Redux frameworks and has increased customization options, using the drag and drop Visual Composer plugin. Eco Friendly WordPress theme is just like its name says, an environmental-friendly theme with a neat and clean design. It comes with a flexible admin panel and all the tools you need to launch your site today. Dolomia is a fully responsive WordPress theme for nature lovers. 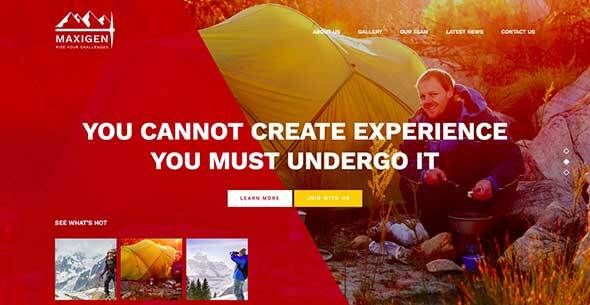 Use it design a clean, minimalist website about hiking, outdoor activities, travel, photography and more. Has plenty of pre-made templates to choose from. Maikop theme can be used to successfully promote your environmental projects or your eco-friendly business. It looks perfect on all modern mobile devices and it’s very easy to customize to fit your branding. 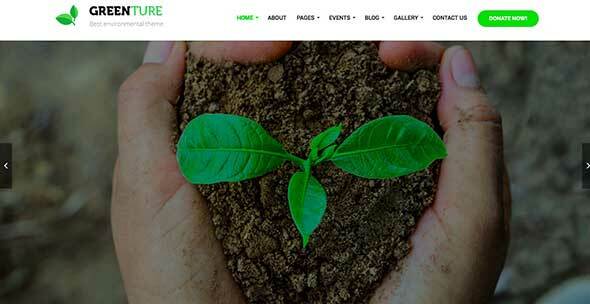 Greenture theme is another environmental-friendly theme targeted to NGOs. This well-designed theme comes with a blog and an events options as well as a donation system. Enviro t is a nature WordPress theme that is fully responsive and looks perfect on any device. Use it to make your eco-friendly business known to the world. 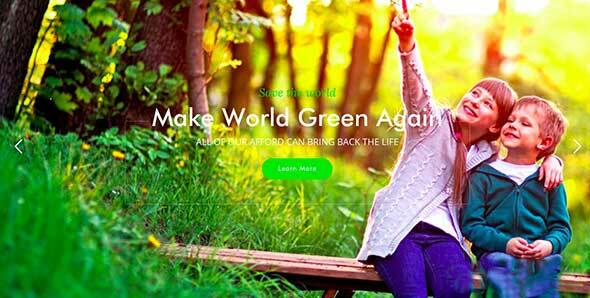 GoGreen is an eco recycling WordPress theme for eco-friendly company websites. This website meets all the standards of nature WordPress themes, it is informative, organized and contains all the tools needed. This is a modern environmental theme for non-profits and recycling companies. It is highly customizable, has an extensive admin interface and it’s easy to install, with just one click. Also has demo content you can use and no coding knowledge is required. Here is a hiking and outdoor activities WordPress theme, built on Bootstrap and fully responsive. It comes integrated with the Visual Composer page builder and has plenty of custom shortcodes you can use. Fatherland is a theme created for local tourism agencies. It has a nature-themed design and pages for blog, excursions and guides. Page templates are also provided, so all you have to do is customize them with your own photos and texts. This is an environment & ecology WordPress theme integrated with the popular Visual Composer plugin and Slider Revolution. it was built on the Redux framework theme. Green Soul is an environment & non-profit WordPress theme that can be used by environment protection companies or any other ecology-related project. Use it to launch eco fundraisers or blog about recycling, alternative energy, organic agriculture and more! 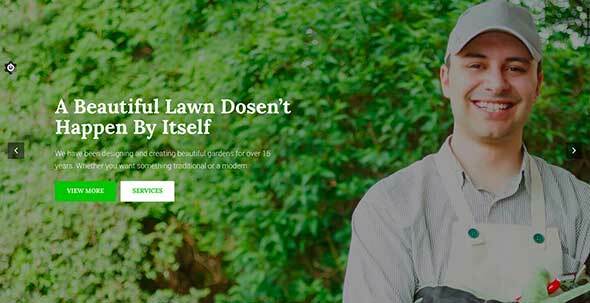 Gardening is a professional nature WordPress theme for gardeners, landscaping designers or agriculture-related companies. It is responsive, comes with both full-width and boxed layout options and was built with Bootstrap 3. This is a travel theme with a focus on nature. Use it to blog about any type of outdoor activities or even set up a booking system for different locations. Ecopark is the perfect theme for caravan parks, tent sites, campsites, and travel booking websites. You can also use it for websites related to different outdoor/ nature activities. It comes with 2 homepage layouts and a lot of features. Use this cool theme for building a website for a non-profit environmental organization. Its features and template designs are also a good fit for recycling businesses and alternative energy sources distribution companies. 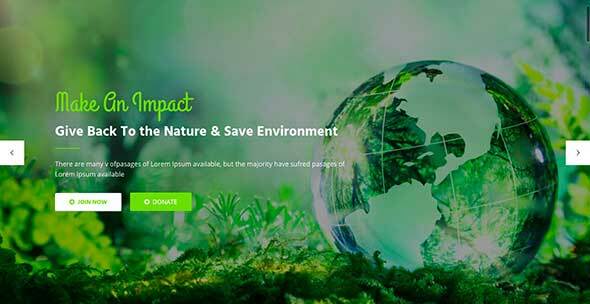 Envit is an environment WordPress theme you can use to get donations for your cause. 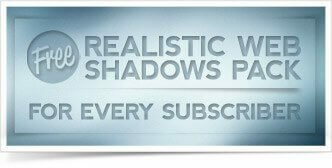 It has a 100% responsive design and was tested on all the major hand-held devices.